Update: As suggested by Anon 18 Jan 2013 07:10, wire for S1 push switch should be connect to relay pin no.85 (together with alarm's trunk release negative output), and another one to ground (car's chasis). Thanks a lot to Anon 0710. Hi, now I want to share what I have done to my Perodua Kancil, "Remote Trunk Release", unbelievable? believe it. Non of Perodua car, even Proton only Waja CPS, Inspira and Preve equipped with remote trunk release. My Kancil now no need to use car key or pull the cable to unlock the trunk anymore, just press button on my car alarm remote. One day I park next to the Toyota Vios, and eventually we walk together to the car park after shopping. As usual, he need to use key to open the trunk, but my RM7000 Perodua Kancil just use remote to unlock the trunk, he keep on staring at my Perodua Kancil. Maybe he wonder how can his RM70,000 Vios doesn't have that awesome function haha.. Most of the stock car alarm doesn't have this function (trunk release), except you drive luxury car. If you change your stock car alarm to aftermarket car alarm, you better go and get back the manual, see weather there is a function of trunk release. If yes, why don't you use it, because you already paid for it. 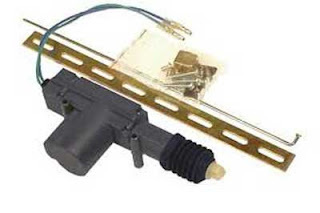 Ok, what you need is a set of auto power lock actuator set (see picture below), 40amp relay, wires, push button, wire tape, your own personal skills and creativity. Standby with drill just in case you need to bore a hole to mount the actuator if the universal mounting (come with actuator set) cannot be use. The first thing , you must prepare the relay with wires. No.86 & 87 of the relay connect to constant 12volt (to battery), advisable to add a 10amp fuse on it, when the wiring done and sealed with wire tape, then now you can connect it to the positive terminal. No.85 connect to the trunk release output of the alarm main box controller. refer to your car alarm user's manual. No. 30, will be connected to the green wire of the actuator. Make sure the wire long enough to reach the trunk. Before you start mounting the actuator, test the wiring first. If the actuator responding downward when you press the trunk release button on your remote, proceed to the mounting process of the actuator. If it upward, swap the wire. Remember, one of the actuator wire must be grounded to vehicle body. Now you have to use your own skills on how to mount the actuator so that the actuator can pull the plunger to unlock the trunk. I think it is more easier if the actuator mounted on the trunk door. Another tips, my friend's car Proton Wira use a bicycle brake cable end and hooked it together with the current trunk release cable. If you want a push button on the dashboard to open the trunk instead of using remote and manual trunk release, you can do it also by connecting wire from 87a to push button and another one wire connect to the no.86 or 87. 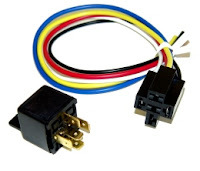 Make sure to remove the fuse first (or disconnect battery positive terminal if not using fuse) because this is constant positive wire, to avoid short circuit. Now, means that you have three options to unlock the trunk; 1- using manuals (stock), 2 - Push button, and 3 - car alarm remote. AWESOME!!!!!! Just Do it..D.I.Y. is Fun..
To help you better understand valve timing, this page will cover blow down overlap and the ram effect. Cool discovery. You will be able to unlock the trunk in three ways. this set up of auto power lock actuator set, is it that abundant in most car accessories? how much does it costs back in your hometown? You can find it easily at all autoparts and car acc shop..
Base on my experience, autoparts shop offer lowest price than car acc..
How if after market alarm doesn't have this function? can do? Still you can do this, by using push button (S1)to release trunk. But you cannot released your trunk by remote. where should i connect no 85 to? If your alarm does not hav trunk release option, just left it empty (no.85). That's meant you only can open your boot by using push button (s1). The wiring diagram is incorrect regarding the push switch. With this wiring, your relay is simply bypassed when the switch is pushed. Meaning all the current required by the actuator runs through the switch directly. If this is intended, then you don't need a relay at all. But this design will sooner or later burn your push switch. The correct wiring would be to connect the push switch between 85 and ground. (In parallel with the alarm trunk output). Thanks for your advice friend..I see that, you're right by connect the push switch between 85 and ground. So far, my push switch still working properly but i think i will make a change to my wiring. Thanks again.. If you require a lot more information, most likely to Hulu Login it has networks. hululogin After registration you will have the ability to sign in to your account on nearly any type of gadget. I am grateful for every post you make.